British Liberal Prime Minister (1894-1895). ALS. 3pp. Dalmeny Park, Edinburgh. November 6th 1896. To [William] Woodall. Together with fine contemporary portrait PHOTOGRAPH. 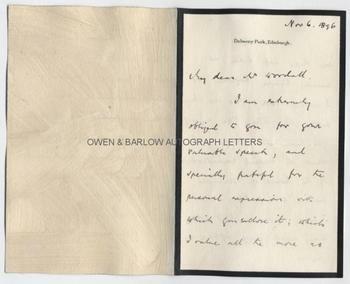 "I am extremely obliged to you for your valuable speech, and specially grateful for the personal expressions with which you enclose it; which I value all the more as we have not been so much thrown together as I would wish. No one knows better than those, like myself, who have never enjoyed it, what the cordial comradeship of the House of Commons means to a public man. I hope, however, that we may meet more often in future. As regards technical education I am galled by the thought that I have not made my point sufficiently clear, and only comforted by the reflection that you have done so. I am on the one hand embraced by protectionists, and repudiated on the other side as a sort of 'malade imaginaire'." 8vo. Approx 7 x 4.5 inches. Mounting residue to the blank verso of last leaf, else fine. The portrait is a fine gelatin silver print photograph measuring approx 5.75 x 4 inches (excluding mount) mounted on card from leaf of an album. 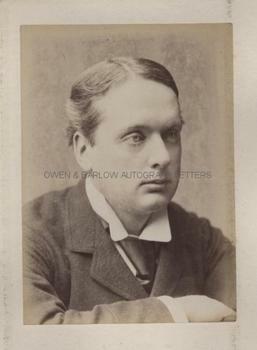 It shows a pensive and youthful looking Lord Rosebery in semi-profile, looking to his left. It is in fine condition. Both the letter and the photograph are from a 19th century collection made by the radical Liberal M.P., William Woodall. Woodhall had been Financial Secretary to the War Office under Gladstone but was also known for his espousal of causes such as women's suffrage and education. With Sir Henry Roscoe and others, he was one of the author's of the Technical Education Bill. The progress of Technical Education had been very slow and this is presumably what Rosebery is refering to. 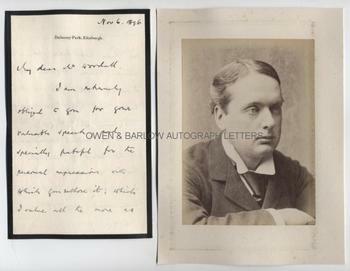 Lord Rosebery had fallen from power in 1895 and he was replaced as leader of the Party By Lord Harcourt. 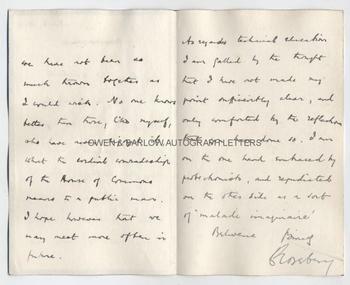 In this letter, written a year after his fall from power, Rosebery demonstrates his feeling of isolation. He quickly drifted to the margins of the Party but by 1900 was trying to make a comeback based on his opposition to the Boer War. However his opposition to Irish Home Rule finally prevented him from holding significant office when the Liberals returned to power in 1905.